The 2018 Re-Wire Policy Conference is set for December 13th at the Hilton Seattle Airport Conference and Convention Center. 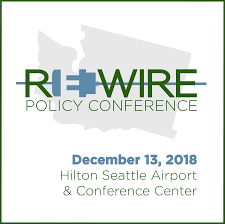 The second annual Re-Wire Policy Conference is a non-partisan, policy agnostic platform for civil, civic discourse on policy, politics, and political economy. As with last year, Re-Wire’s purpose is to create a gathering, a physical space where the most important policy makers, opinion leaders, and corporate actors can gather to network, discuss solutions, and foster trust. The conference will be one of the largest and most diverse convenings of senior executives, thought leaders, and policy makers in Washington State.